"I want to provide you with my view as an Aboriginal person, a perspective based on social justice, about the process of reconciliation. I want to go to the heart of what I believe the issues are that Australia and Australians must address if Australia is ever going to deal with the legacy of its past. If this legacy is not addressed, if the gulf that has created a society of inequity, of them and us, is not faced fully and honestly, then we will forever remain a diminished nation. A nation that puts its head in the sand and says it's someone else's responsibility. Identity is where we need to start. Australians need to begin to understand Aboriginality, to at last appreciate what being Aboriginal means. This is an understanding I wish I could magically endow into the hearts and minds of all people in Australia. I would like to share with you a very personal experience, as personal as it is probably universal for Indigenous people right across the planet." 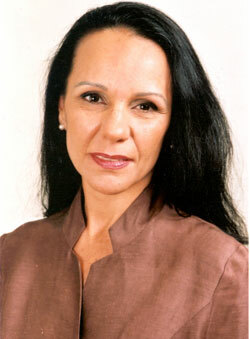 Linda Burney is of Wiradjuri and Scottish descent and grew up in Whitton, a small town in south-west NSW near Leeton. Burney attended the local primary school in Whitton. She did her first four years of secondary school at Leeton High School and final two at Penrith High School. She was the first Aboriginal graduate from the Mitchell College of Advanced Education where she obtained a Diploma of Teaching. She began her career teaching at Lethbridge Park public school in western Sydney in 1979. She has been involved in the New South Wales Aboriginal Education Consultative Group since the mid-1980s and has participated in the development and implementation of the first Aboriginal education policy in Australia. She has held senior positions in the non-government sector, serving on a number of boards including SBS, the NSW Anti-Discrimination Board and the NSW Board of Studies. Burney was an executive member of the National Council for Aboriginal Reconciliation, President of the NSW Aboriginal Education Consultative Group and is a former Director-General of the NSW Department of Aboriginal Affairs, and in 2006 she was elected National Vice President of the Australian Labor Party. When Burney was elected as the Member for Canterbury in 2003, she became the first Aboriginal person to serve in the NSW Parliamen where she held numerous portfolios. In 2016, Burney won the Fedral seat of Barton, becoming the first indigenous woman to be elected to the Australian House of Representatives. On 22 July, she was appointed Shadow Minister for Human Services.